How are you today? The godparents of our boys recently had their own beautiful little cherub, Tate. I offered to make them some thank you cards to send out as they got absolutely spoiled rotten at the baby shower & after Tate was born. And so they should! They are a wonderful couple! 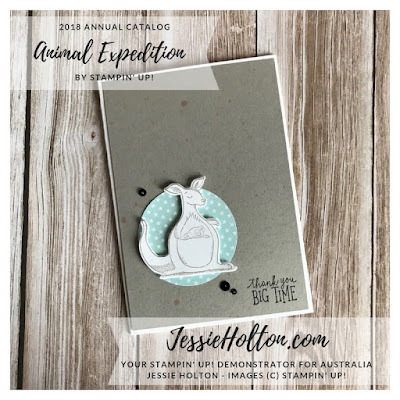 So I made up a bundle of these cute but simple cards using the Animal Expedition Bundle. I just happen to have a class coming up on Saturday 17 November, so if you're in the Bellarine area & you'd like to join us, please let me know! I'd love to craft with you! 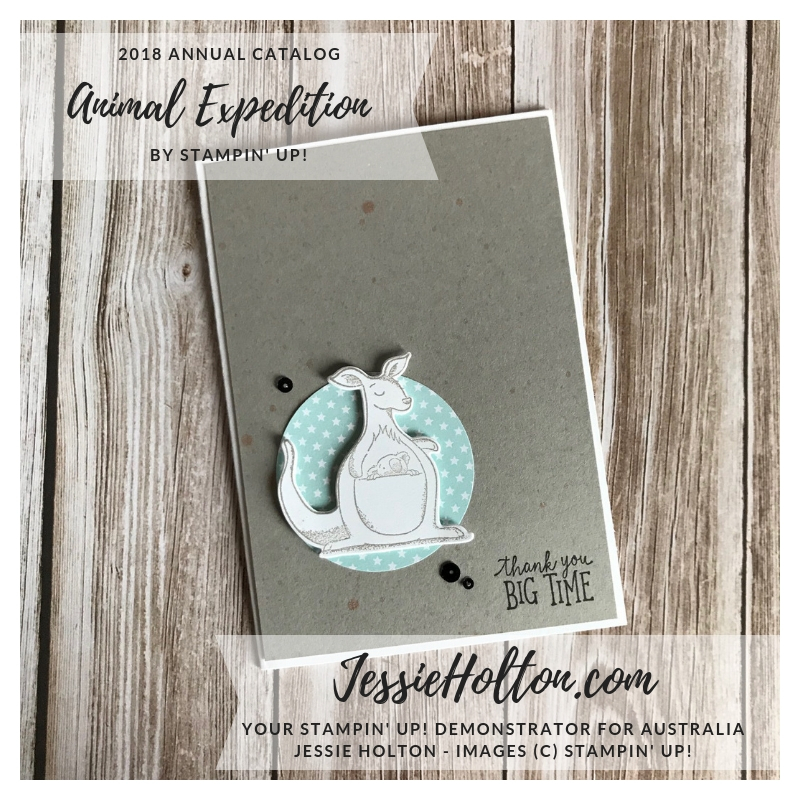 I've stamped the kangaroo from the Animal Outing stamp set with Gray Granite ink on Thick Whisper White cardstock & die cut with the coordinating frame from the Animal Friends dies. The sentiment is also from the Animal Outing stamp set, inked in Black Momento. I have spritzed all the Granite Gray cardstock with Copper Shimmer Paint mixed with rubbing alcohol. I've used the 2-1/4" Circle Punch to cut the Pool Party star design from the Twinkle Twinkle Designer Series Paper. All on a Thick Whisper White base with a few black sequins from the Metallic Sequin Assortment for good measure. 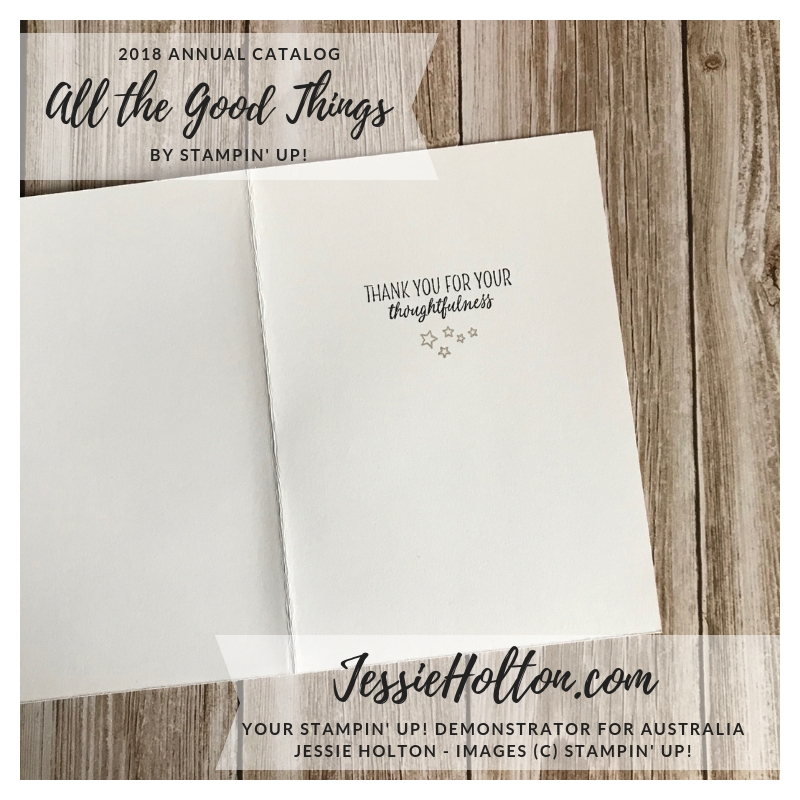 The sentiment on the inside is from the All the Good Things stamp set (inked in Basic Black) & the stars are from the Best Bunny stamp set (inked in Granite Gray).